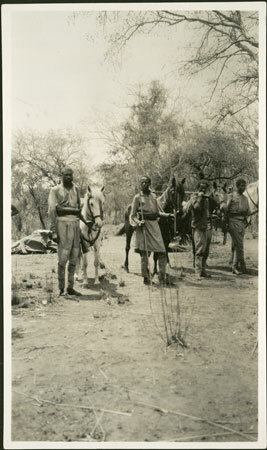 A group of Sudanese expedition porters or gun carriers holding the bridles of their horses. Most of them are carrying rifles, with ammunition belts. Morton, Chris. "Mounted expedition porters" Southern Sudan Project (in development). 03 Jan. 2006. Pitt Rivers Museum. <http://southernsudan.prm.ox.ac.uk/details/1998.204.5.79/>.